In the early days of the web, HTML documents were served over HTTP. The original HTTP protocol was a simple human-readable ASCII implementation. Over time, two major changes came to HTTP: In 1994, Netscape introduced an encryption and verification layer known as HTTPS; and in 2015, the W3C finalized the HTTP/2 specification, which includes data compression and server push (bidirectional) capabilities. HTTPS was originally envisioned only for high-security situations, like banking and e-commerce, but with en-route content injection and other security concerns, vendors began pushing for increased use of encryption and verification. In 2010, a Firefox extension “HTTPS Everywhere” was released, one of the first hints that all traffic would eventually be transferred over an encrypted channel. Fast forward to 2016. Browser vendors have increased the urgency of moving sites to HTTPS. Google and Firefox have joined efforts to deprecate non-secure HTTP. W3C has joined in, saying that “We recommend that such legacy functionality begin requiring a privileged context as quickly as is reasonably possible.” Current versions of Chrome and Firefox already issue console warnings for data submission over HTTP, and within a year, in one of the first major breaks in backwards compatibility for the web, many existing capabilities will be rejected over HTTP. Adoption of HTTPS has been held back by the cost of certification (a TLS certificate can easily more than double the cost of web hosting) and, for those running their own servers, the complexity of installation. To act as the carrot corresponding to the aforementioned stick, major web players have created the Extended Verification certificates. 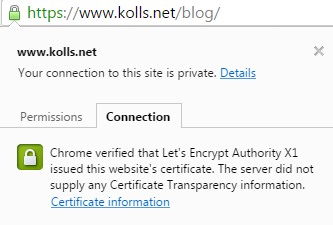 Acquiring and installing a TLS certificate from Let’s Encrypt or another reputable source. Adding a server rewrite rule to redirect all HTTP requests to HTTPs. Ensuring that subsequent client connections can’t be hijacked via HTTP using HSTS to tell the client to never attempt to connect over non-secure HTTP again. An additional server rewrite rule enables HSTS.